MSRP: 25.00 or 27.17 Euro or 20.69 pounds, depending on where you shop overseas. My kit has a copyright of 1988. Named for Soviet Marshal Kliment Y. Voroshilov, the KV-1 heavy tank played a major role in the defense of the Russian homeland, fighting alongside the famous T-34/76 tanks of the Second World War. It had heavy armor which was 75 mm thick at the front, and mounted a powerful 76.2 mm gun. It was powered by a water-cooled, 12 cylinder diesel engine of 550 horsepower. In 1940, an improved version of the KV, known as the KV-1B, or "Applique" model, was ordered to counter the increasing threat of the heavier gunned German anti-tank forces. 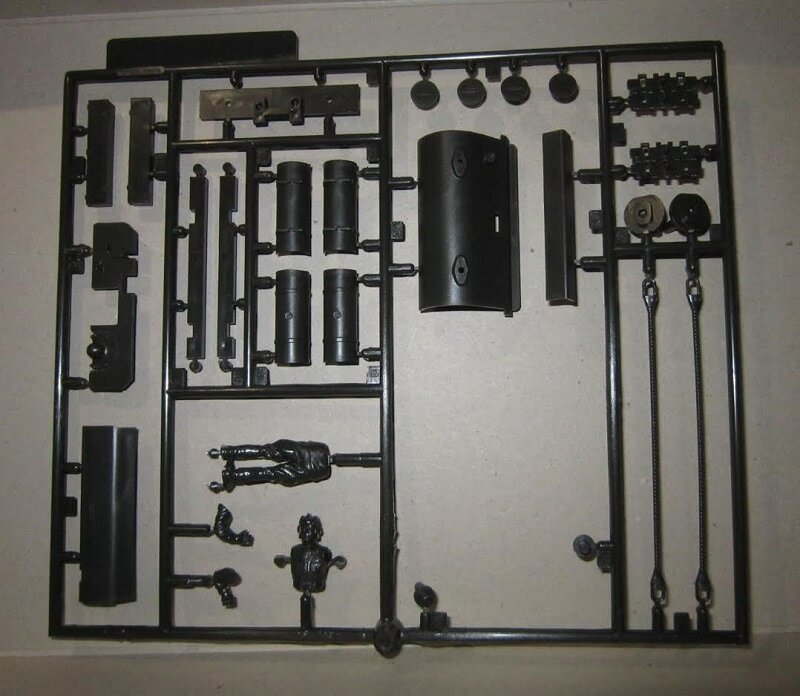 Since the factories at Kirov, where the KV-1 tanks were produced, were not equipped to produce armor exceeding 100 mm in thickness, they had to use bolt-on applique plates of 25 mm - 35 mm thickness. 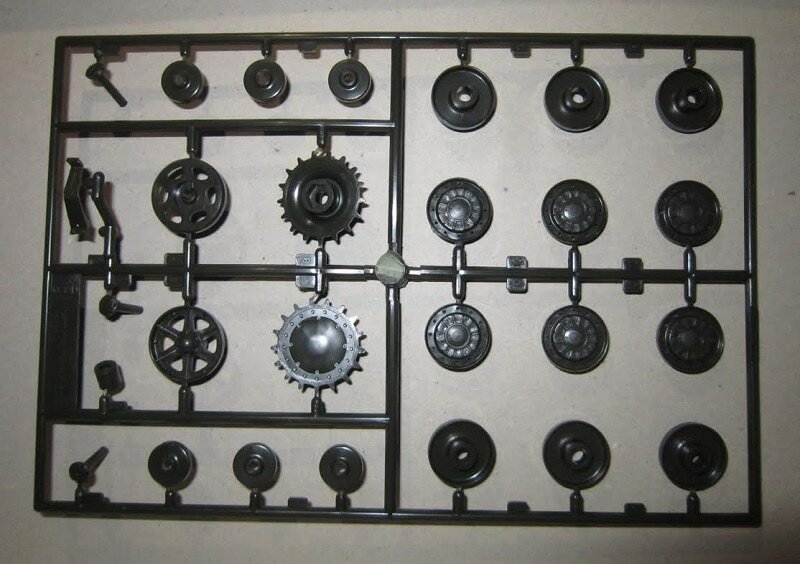 These were added in the turret and hull using large bolts. This resulted in increased thickness at the front of the turret to 120 mm, 110 mm at the turret side, and 110 mm at the hull front. The Germans were terrified of these Soviet KV-1B tanks which could now withstand and combat the German anti-tank projectiles. The bolt-on armor was later altered to a welded method for better productivity. Although production of the KV-1 series ended in July 1941. The tank was active throughout the conflict, and the basic ideas were later incorporated in modern tanks of the Soviet Union and other nations. I have 3 different versions of the KV series of tanks by Tamiya. I intend to review them all and have started to build this one and one of the others. They all share the same hull tub and hull roof. Two share the same road wheel pattern, but the third one is different. All three have different turret designs. Some are motorized kits, but I doubt I will ever build them that way. 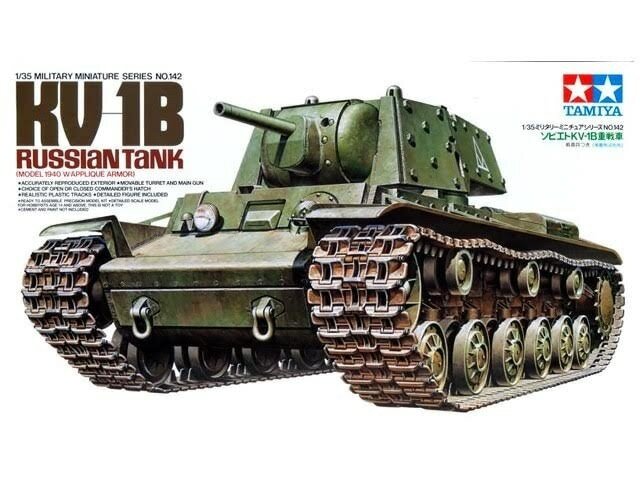 The box art shows a KV-1B posed against one of Tamiya's SIGNATURE all-white backgrounds that they use for most of their box arts. The KV-1B is in overall dark-green and is unmarked. 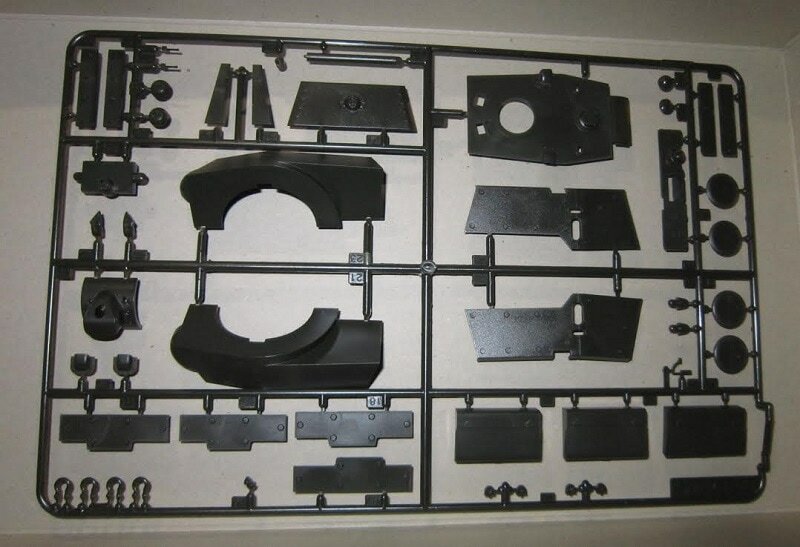 A corner of the box says the kit has accurately reproduced exterior, moveable turret and main gun, choice of open or closed commander's hatch, realistic plastic tracks and a detailed figure. Modeling skills helpful if under 10 years of age. One side panel has a color 3-view of a KV-B in overall dark-green with a white BEN plus some other soviet words. A crewman is illustrated beside it. There is a paragraph in Japanese here too, but I haven't a clue what it says. Maybe the history of the tank?? The copyright of the kit is 1988 and Tamiya's street address in Shizuoka City, Japan is provided. The other side panel has a color side view of a KV-1B that is again overall dark-green. It has a white word HANN 3A and some other Soviet words on the side of the turret. This is followed by another paragraph in Japanese and color box arts of Tamiya's kits of the KV-1 and the KV-II. This kit contains 4 dark-green parts trees in 3 cello bags, a loose dark-green hull tub and hull roof part, vinyl rubber band type treads, vinyl poly caps, the decal sheet and instructions. The instructions consist of a single sheet that accordion-folds out into 6 pages in 7" x 10 1/4" page form. Page 1 begins with a black and white photo of the model and the figure made up. The tank has a white triangle on the turret sides with a letter V in it. Below this photo is the history of the KV-1B in English, German, French and Japanese. Page 2 begins with READ BEFORE ASSEMBLY instructions a picture of tools that are required a suggested paint list for finishing the model, over the first 2 assembly steps. Pages 3 though 5 continue with a grand total of 10 assembly steps. Page 6 is the painting and marking instructions. There is one 3-view and two 2-view side profiles of turret markings shown. The 3-view is the KV-1B with the white triangle with the letter V in it. It is a tank on August 1941, at Leningrad (suburb of Luga). The 1st side profiles has white BEN + some other Russian words on the turret sides. It is a KV-1B shown in the summer of 1941. No unit is given. The 2nd side profiles has white HANN 3A + some other Russian words on the turret sides. It is a KV-1B shown in September 1941. Again, no unit is given. There are no parts trees illustrations in the instructions. Parts trees are alphabetized and have part number tabs next to the parts on the trees. The completed turret ready for painting. ​The hull tub and hull top parts are the last of the dark-green parts. 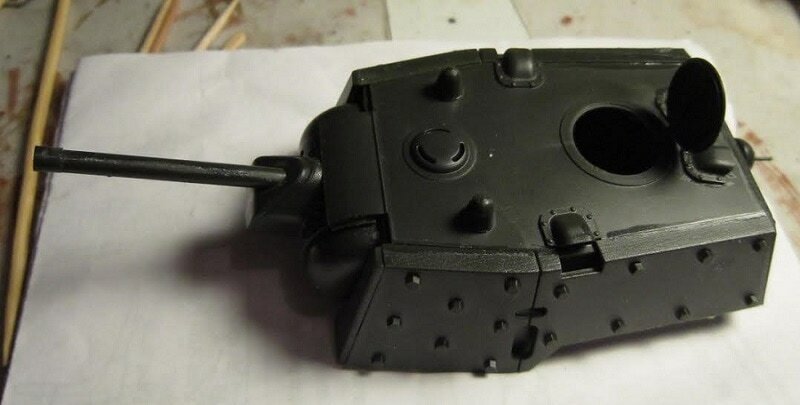 The hull tub has motorization holes in it, because Tamiya also sold this kit as a motorized version. To build the kit as a static model will require modelers to putty up these holes. I have built a sheet plastic wall behind these holes and have to now apply putty to the holes and sand it down. ​Next is the 2 runs of vinyl rubber-band type treads. ​The decal sheet and instructions finish up the kits contents. ​This is a neat KV version with it's applique armor. I have this kit 95 % done and will do a build review of it soon. ​I purchased my 3 different KV kits back 20 years ago at my local hobby shop.